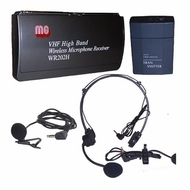 VHF Receiver, transmitter, lapel & headset microphones with one radio channel frequency. Requires two 9-Volt Batteries (not included). Includes cables to connect to amplifier.